The Friends of Pheasant Wood (Residents within the Pheasant Wood Ward in Thornton-Cleveleys) have run two physic nights, raising £700 for the Willow Garden Project. Special thanks to physic James Bryan and All involved with organising and very kindly giving their time for free to support the Willow. It is very much appreciated, thank you. 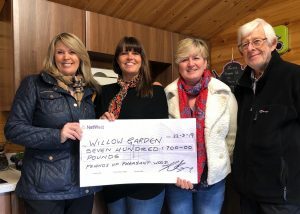 Debbie, Kathryn and Eddie presenting the cheque to Pamela Laird, founder of Willow.